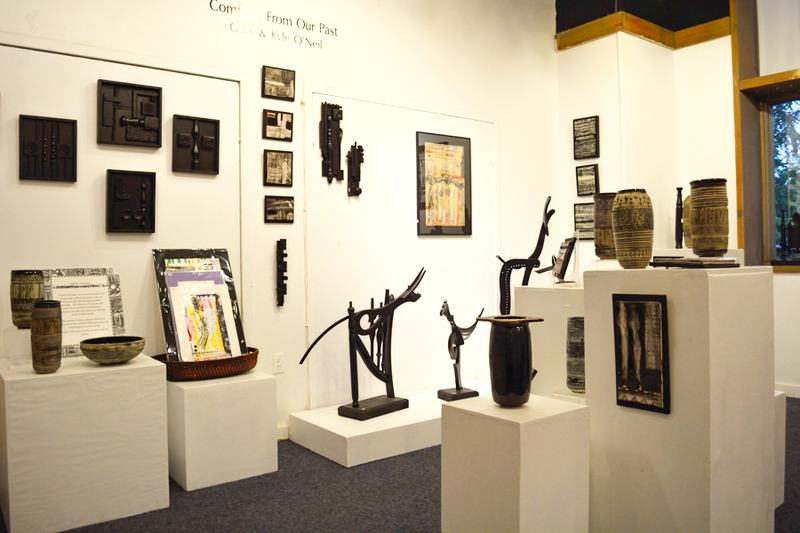 The exhibition features animal-like figures, pots, and monoprints, all of which contained parts of furniture and household items that Gary saved from his great-grandparents’ house in the 1990s. As his family helped move the older generation out to more accessible housing, where his relatives saw garbage, Gary saw opportunity. Gary, a Wangunk family historian, builds upon the forms of recording his history and storytelling with this exhibition. 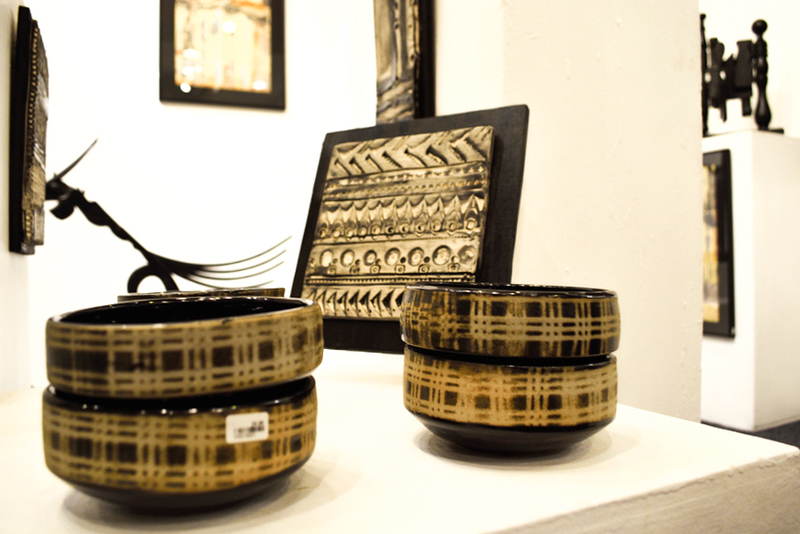 Gary was born and raised in the Middletown area and has had a long history with Wesleyan Potters. 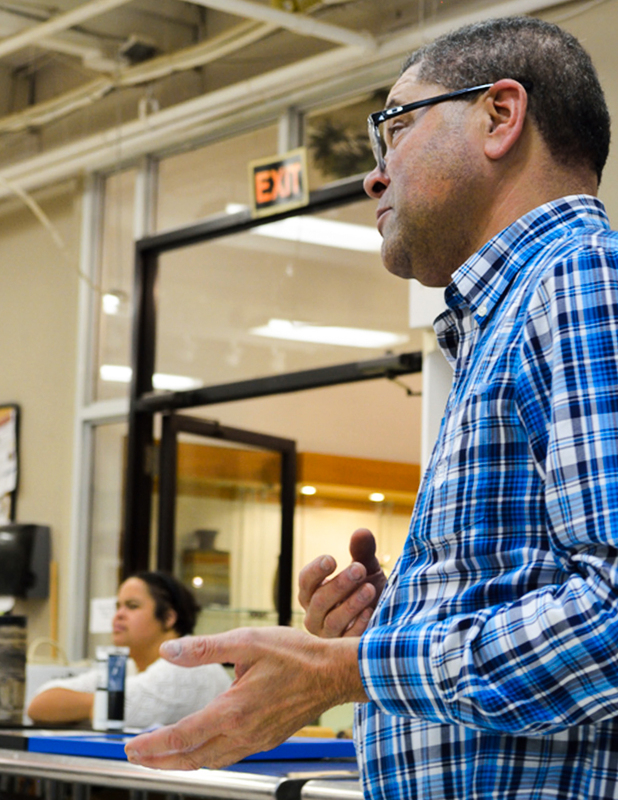 He was first introduced to the pottery center in the 1960s through an art teacher’s urging, and at age 15, he began an apprenticeship there. “I’ve had every job at Wesleyan Potters from cleaning shelves, to sweeping, to working the parking lot during the Christmas sale,” he said. Wesleyan Potters hired him directly out of school, and he worked his way up from teaching children’s pottery, to teenage pottery, and now to adult pottery. Along the way, Gary had a daughter: Kyle. Kyle has Down syndrome, but despite her disability she has been creating pieces since 1999. Gary discussed the challenges of getting Kyle confident at the beginning of her artistic career. When she was young, Kyle cut up coupons with scissors to connect with others. Soon, Kyle began to produce work on a regular basis and eventually was asked to show several pieces at the first World Down Syndrome Day at the United Nations in 2012. Gary pivoted to the personal nature of the exhibit’s subject matter. Gary and Kyle have collaborated on exhibits before: “Continued Journey” at Wesleyan Potters, “Faith in Possibility” and “Leap of Faith, Legacy of Faith” at Gallery 53. However, this exhibition is new territory for the duo. During the process of breaking down family heirlooms, Gary continually recollected the importance of his great-grandparents on his life. Gary discussed why he created what he made and which pieces he began to build the collection from. The artist talked about the importance of the textures of materials used in his pieces and how he based his creations on his great-grandmother’s commitment to recycling. Gary incorporated furniture, wooden spoons, knobs from dresser drawers, clothes pins, and canning from his great-grandparents’ belongings. The furniture reminded him of their rocking chair; the spools of thread brought back memories of his grandparents’ job at a thread company. 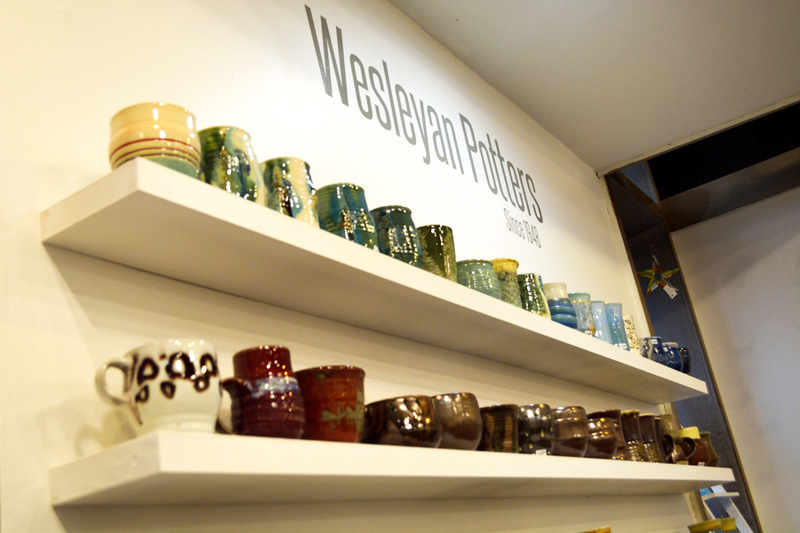 The exhibit will remain open to the public at Wesleyan Potters until Nov. 4, 2016.